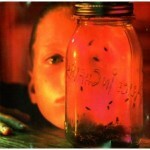 The 1994 Jar of Flies EP from Alice in Chains was a favorite of wee 15-year-old Heather, an alt-country twanged collection of seven songs that melded the moodiness of AIC with occasional pop flourishes (witness “No Excuses”). That album is one of the few from my collection during those high school years that still holds up relatively well (also, my unparalleled artistic skills in drawing the AIC logo in pencil on my binders). I’m pretty excited to hear Ryan Adams take on “Nutshell” from that EP, the b-side to the tour-only 7″ he is selling on his current European dates. This cover reminds me of some of his haunted 29-era songs. The other side of the single is “Empty Room,” a new tune that finds Ryan and wife Mandy Moore harmonizing. This is also not the first time Ryan has taken on the songs of Staley & Co. He’s a fan. Tagged with alice in chains, covers, ryan adams. Not normally a big Ryan Adams fan, but I’ve always loved Jar of Flies. He doesn’t change much on this cover, but that’s probably the right move. Thanks for sharing! Ahhhh! Two of my great loves combined again! On Ryan Adams I caught his wonderful Oxford gig last week in the sweltering heat of what has turned out to be the British summer. He was on great form including a stellar version piano version of NEw York New York, a very bluesy “Carolina Rain” and a brilliant new song “Shadows in the night”. It was in essence an Acoustic Greatest Hits with every song you would want him to play on display and stacks from “Heartbreaker”. He was also very funny with his anecdote about “King Duck” very witty and his description of the city of Dreamy Spires as a Magic Kingdom absolutely spot on. A great night and a great new album produced by Glyn Johns in the offing. I always knew that Ryan was a huge Alice in Chains fan after his cover of Down in a hole, but this is just brilliant. Thank you for this and your great site!